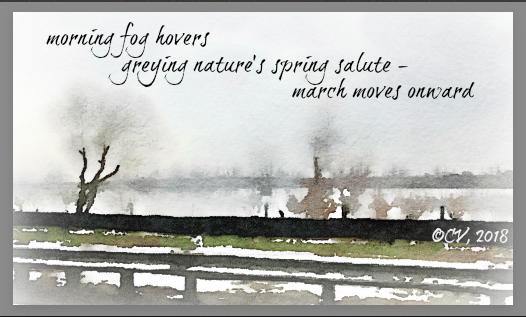 In the greying fog of morning, we packed the car and headed north as we had done so many times over the past years. We were bound for my childhood home, Syracuse. The ride seemed easy, a rare phenomenon on the route from Long Island to the Tappan Zee Bridge. As we crossed over the newly constructed passageway north, we were struck by the beauty of the angular steel. Then, as so many times over the years, tension was released and life seemed to slow down. We arrived safely at my sister's house in time for the Good Friday service at the Cathedral and a wonderful evening dinner. I rise to see my little grandbaby moving her arms in different directions, waking to morning in a new environment. All the anticipation for a family holiday weekend in Syracuse has finally turned into a reality. Beside being with Baby Sierra, there is an extra bonus to this sunny day-no snow on the ground and spring in the air. 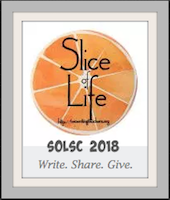 I start this last slice to finish the 31 days of writing for the March Slice of Life Story Challenge at Two Writing Teachers but place it aside because the family is off to see the Easter Bunny. Unfortunately, the Easter Bunny looked a bit bedraggled and the line was about two hours long. A change of plans is in order. Since there are no other Easter Bunny showings nearby, I turn my attention to finding a delicious birthday/Easter cake for tomorrow. The chase is on. Returning back to my sister's house, I find a few moments to finish this slice while Sierra sleeps. -Meeting many new connected educators during the March writing challenge. -Slicing with former friends, commenting, and supporting each others' writing journeys. -Finishing my collection of slices under the title March Musings 2018. -Anticipating the awaited Easter weekend happening with my grandbaby. As the month comes to a close, I sit quietly. 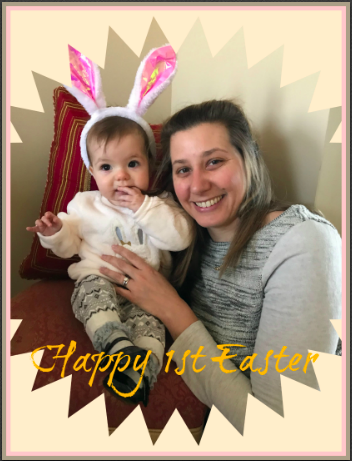 I celebrate family gathering together for Easter, writing challenges, and Sierra's first Easter. Tomorrow is another day of joy. and Two Writing Teachers for providing the space to write in community with others. Day 31-I made it to the end of this writing challenge! As we near the beginning of April, not only is spring in the air (finally) but National Poetry Month, the largest literary celebration in the world, is being celebrated. 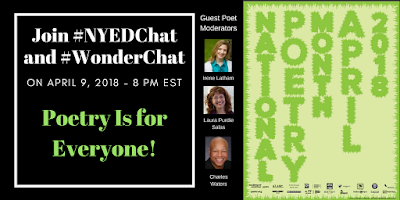 To honor the impact of poetry on our culture and in our lives and promote #poetrylove, #NYEDChat and WonderChat will host a long-awaited poetry chat. My amazing poetry friends, Irene Latham, Laura Purdie Salas, and Charles Waters, will guest moderate. John MacLeod from Wonderopolis will moderate alongside me. Save the date, April 9th at 8:00 pm EST for our combined Twitter chat, Poetry Is for Everyone. There will be announcements, reminders, and a countdown to call everyone into this global chat because poetry is not just for the educational world. Stay tuned for more because John MacLeod from Wonderopolis, the three poets, and I have been planning this chat for months and we want to spread #poetrylove across the Twittersphere. 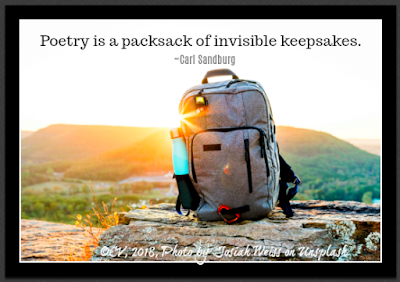 Here's a digital inspiration on poetry that I created for you to ponder. Everyone has keepsakes. Which ones do you have hidden in your soul? Will you join me to celebrate poetry this April during any of the following happenings? 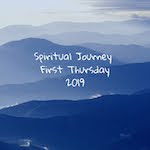 -I will host Spiritual Journey 1st Thursday on April 5, 2018 at my blog site, Beyond LiteracyLink. The writing prompt that I will be using is "Poetry as a Spiritual Practice of the Heart". 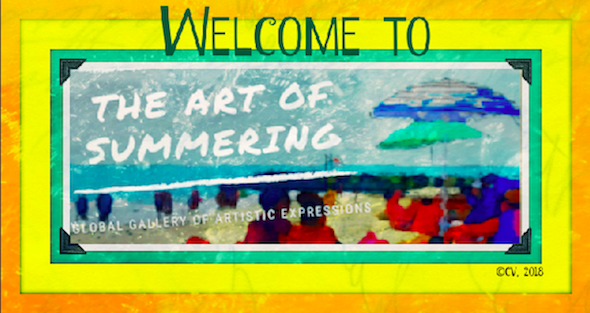 -I will unveil my winter gallery of artistic expressions, Winter Wonderland. -I will be part of the annual Progressive Poem organized by Irene Latham. I will add my one line to the poem on April 12, 2018. Thank you for being a faithful reader and poetry lover. P.S. I am heading over to my poet friend, Heidi Mordhorst's blog to celebrate Poetry Friday. 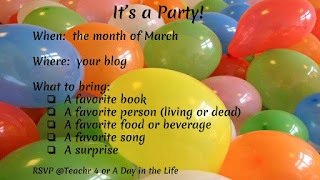 Then, I will be making my appearance at Two Writing Teachers for Day 30 of the March Slice of Life Challenge. Tonight, when the heart started to tire and the writing slowed down, I paused for the creativity surges to be turned on once again. 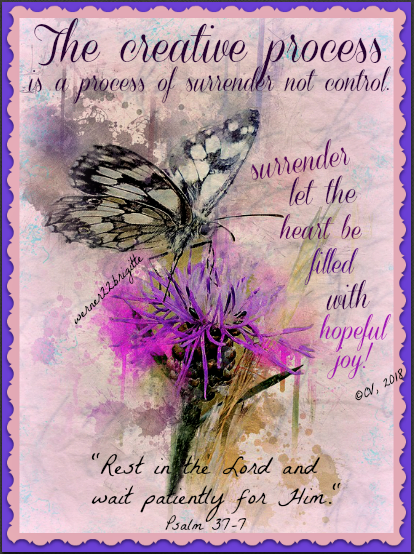 Inspired by scrapbooking art and the word surrender, I created a notebook page of thoughts. Then, I went further and designed a digital inspiration. Wait and be patient is a slogan that I need to embrace! March Musings #28: What If? What if I was proactive each day? What if I did not pass time away? #DareToBe held a Twitter chat last night on the topic, "Dare to Be Proactive!" 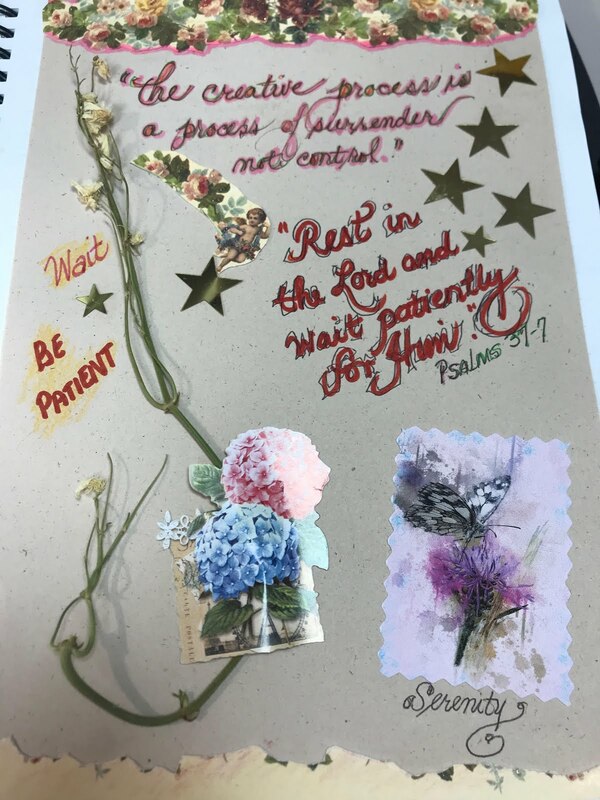 I have been procrastinating completing a few larger projects lately because of the what if questions that loom in my mind. To unclutter my mind and be able to move forward with what I would like to accomplish, I created a video poem that you can access below. Now off to today's task. to brighten the pathway of positivity and possibility. to find your greatness as we lift our voices on Twitter. Many connected educators, including #NYEDChat, joined together on March 24th at the Connected Educators of Long Island Summit, #CELI18, organized by Dr. Bill Brennan to connect, learn, and share. Have you ever awakened and knew you were still in one of your dreams? Lately, dreams have been dancing in the fertile playground of my mind. Hearing Yanni's Echoes of a Dream play on my car radio made me think of the dreams that disturbed my sleep pattern and echoed in my mind throughout the day. Kevin Hodgson, created a video poem, Further Dreaming. Dreaming in story format is a phenomenon that happens during sleep time. Dreams may be based on how we feel before retiring for the night. They could be triggered by what we are worrying about, hoping for, or our to-do list. Remembering my dreams may be a way to spark creativity, get in touch with my emotions, or just be echoes of my mind wandering in the darkness of sleep. I wonder, why I have lingering thoughts haunting me when I wake. Today, I may have woke feeling uneasy but on a positive note, whatever was echoing in my mind provided me with an idea for writing. I just wish I could remember what I dreamt about last night. That might make an interesting story. What's a birthday without a wish and a cake? This morning, I greeted my husband with "Happy Birthday" and then, fell back asleep while he took my son to work. I finally woke at 10 a.m. and realized that I did not order the cake. Oops, what shall I do? Our family tradition is that the birthday person decides on how the day is to be spent, gets a delicious meal of his/her choosing, and has a delicious birthday cake to blow out to the tune of a family chorus of Happy Birthday. My mother always made each of us a beautifully decorated, tasty cake for each birthday but now I have to rely on my own baking skills to create a cake to my husband's liking. The clock is ticking. As my husband comes in the house, I wish him Happy Birthday. Then, I start thinking what can we do. 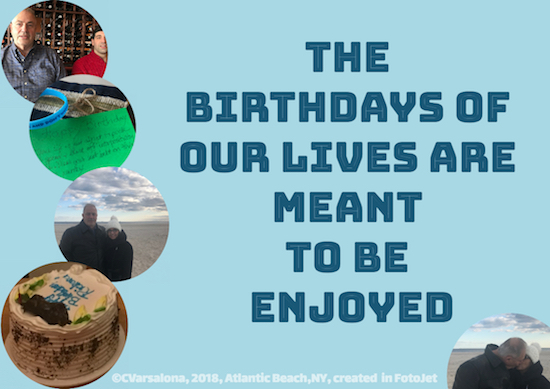 A walk on the beach, dinner out, a cake? The cake is first on the list but I don't have time to bake. Cassata cake, an Italian cake soaked in rum with a layer of cannoli cream and whipped cream on the outside, is decided upon. I call the bakery and am grateful that they are still open. As we are ready to leave, my husband hears the phone buzzing. It is my daughter and our grandbaby in her jumping chair ringing us on Google Hangout. Once we connect we see Sierra who is more interested in the phone flashing in front of her than watching us on a little phone screen. She quickly beomes disenchanted with the call which is not like her at all. She usually is so happy when we have our long-distant talks so we agree to talk later. Off we go to the bakery. There is one cassata cake on the shelf. I stop to look at all of the choices and by the time, I decided to take the cassata cake, someone else picks it up. Off we to the Italian bakery nearby. There are two choices of cassata cake there. The traditional yellow cake and one that we never had before, chocolate with chocolate pudding and cannolli cream. We take the chocolate one and start traveling home thinking about where we should go for dinner. Birthdays are whole day affairs in my home. By the end of the day, my husband was so tired from a full day of birthday fun that he went off to sleep early. Part two of my husband's birthday tradition comes next week when the whole family gathers for Easter at my sister's house in Syracuse. Today, I am a learner who firmly believes in the power of positivity and the impact of being connected as a way to advance my learning . Today, I am a traveler traveling to the Connected Educators' of Long Island Summit, #CELI18, where I will discover new ideas to impact teaching and leading. Today, I am an educator ready to connect with 475 other educators from Long Island and surrounding area at #CELI18. I will reach out to new colleagues and greet familiar faces. 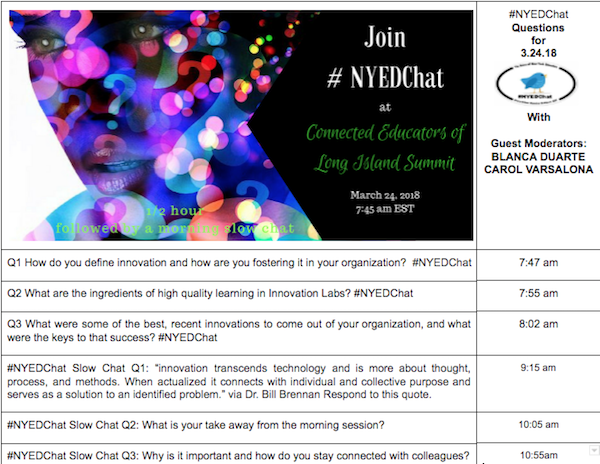 Today, I am a moderator of #NYEDChat hoping to lead a virtual, fast-paced , half hour conversation at #CELI18 among connected educators with my friend Blanca Duarte. We will follow the breakfast chat with three slow chat questions during the morning. 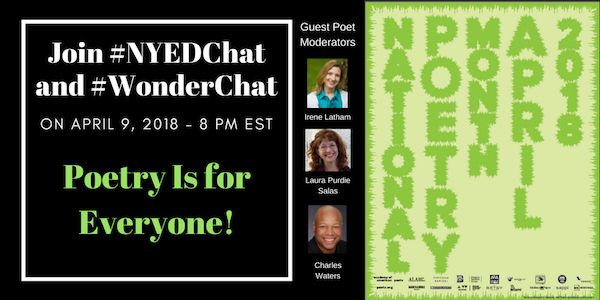 Today, I am full of hope that many tweeps from our vast #PLN tribe will join the #NYEDChat conversation from all corners of the Twittersphere to share ideas and learn from each other. Below are the questions, if you are interested in participating. While virtual communications bind us together in unique ways, the aha moments of face-to-face conversations are not to be missed. I am excited to be part of the connected education movement where innovation, positivity, and creativity thrive. 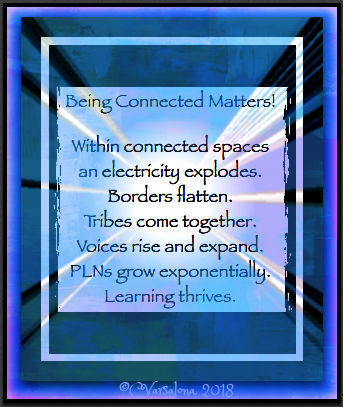 Within our tribe of connected educators, trust and support exist as we journey to find our greatness as lifelong learners. Before connected learning was popular, voices were in silos. People worked alone, trying to navigate their path. One shot professional development did not open doors to enlightened learning unless strategies discussed were implemented, reflected upon, and shared with colleagues. Now with the advent of choice-driven learning, connected educators can engage with others in professional conversations that ignite additional learning and reflective actions, like the ones that I will be experiencing today. I leave you with an inspiring thought from Dr. Bill Brennan, one of the original founders of #NYEDChat and Assistant to the Superintendent for Innovation at Farmingdale School District. "Innovation transcends technology and is more about thought, process, and methods. When actualized it connects with individual and collective purpose and serves as a solution to an identified problem." Join me today as I connect with colleagues, lead with #NYEDChat, and learn at #CELI18. 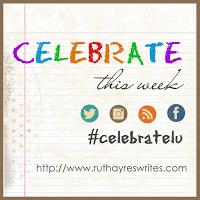 with Ruth Ayres and the Celebrate This Week writers. Wednesday night as the nor'easter settled down for a #winterinspring nap, I captured its beauty, wondering what to expect next. Knowing that the morning commute across Long Island would be long and laborious, I went to sleep but the thought that my the alarm would not go off made me jittery. I kept waking and checking outside my window. Each time I looked, it appeared that the snow inched higher and thicker than before. A quick wake-up call announced, "Two hour delay for my workshop presentation." I peered out from my window. The neighborhood was even more still than the night before, except for huge snow droppings from heavily snow-laden limbs. Off I went to get a few more winks of sleep until another call woke me. "Workshop canceled. It's a snow day." ...and so as the tale goes, Lady Winter continued to hang onto her winter dreams and created one more #winterinspring day. 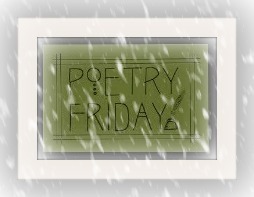 Poetry Friday is being hosted today by the wonderful children's poet and writer, Laura Purdie Salas at Writing the World For Kids. Please Save The Date, April 9th, for the combined #NYEDChat/#Wonderchat to hear from Laura Purdie Salas, Irene Latham, and Charles Waters as they celebrate National Poetry Month with twitters. From my high school French teacher, I learned that it is proper etiquette to Respondez s'il vous plait to invitations. On March 1st, a writer friend of mine, Leigh Anne Eck, sent out an invitation from her blog site about her virtual March Slice of Life Story Challenge party. Knowing that I love a good party, I stored the online invitation away but that was not a smart move because my desk is a cluttered mess and I cannot find anything. Thanks to my Wonder Lead Ambassador/slicer friend Christie Wyman, her blog post reminded to RSVP. You can find the enlarged version of this digital creation at Buncee here and be sure to listen to Abba's song to get in the dancing mood. After I send this out, I will have officially RSVP'd. Leigh Ann asked us to bring a surprise to the party. 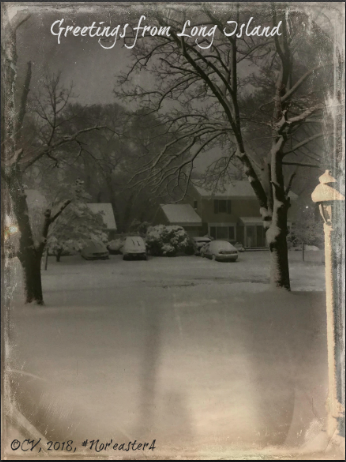 Since today is Nor'easter #4 and the day after World Poetry Day, I will bring poetry postcards so party goers can create #imagepoems of Long Island's #winterinspring. This scene from late last night was the right choice for a daguerreotype look. Now it's ready for a poem. Anyone interested in creating one? Poetry is a window onto the breath-taking diversity of humanity. 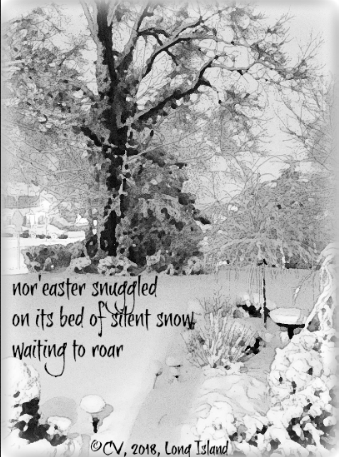 Last month, twenty-eight days of ekphrastic poetry writing with Laura Shovan at her 6th Annual February Poetry Project, cleared a path for me to continue writing poetry, celebrate World Poetry Day, and make preparations for my winter gallery of artistic expressions, #WinterWonderland18 to be unveiled as a National Poetry Month gift of poetry love. Writers, bloggers, poets, photographers, Twitter colleagues, educators, and students from around the world have joined me in a global, poetryliscious celebration of the creative spirit. Stay tuned for the unveiling of Winter Wonderland Gallery. surfacing from the unnoticed and unseen. Hope prevails in the midst of earthly challenges. 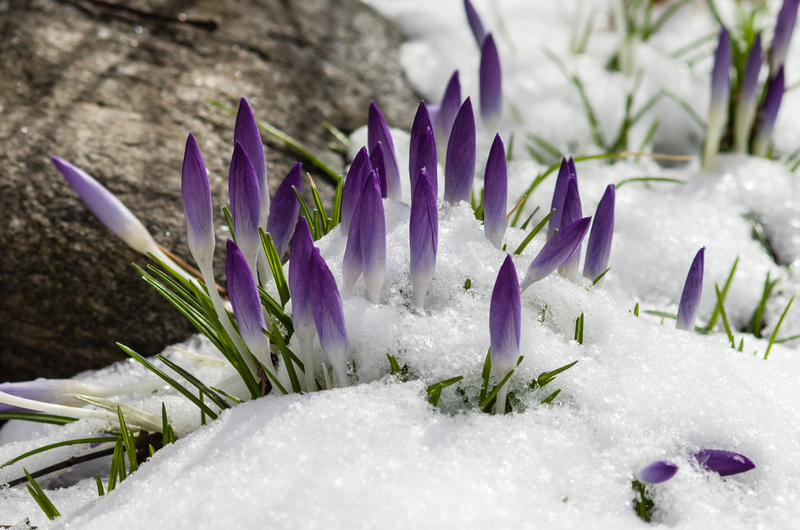 to become the miracle of spring and all it promises. When my Twitter friend, Rita Wirtz, came back to writing her Bam Radio blog post, I felt compelled to write her a poetic response to her statement, " Hope is the miracle, the defining moment", so I lifted her line and wrote. We are defined by who we are in the midst of challenge. March Musings #7: Have You Ever? 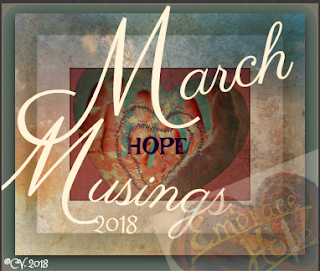 March Musings #2: March Roars!